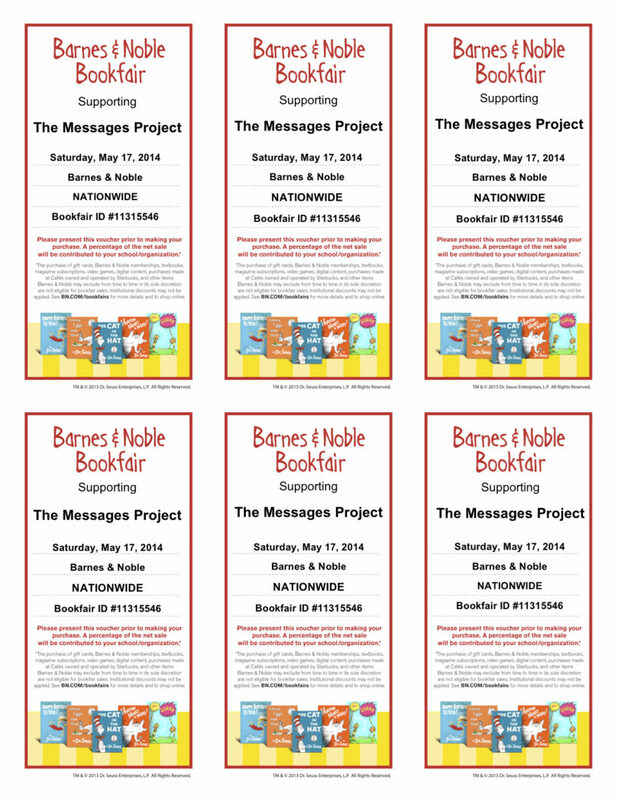 Visit your local Barnes & Noble store on Saturday, May 17, 2014. Bring a copy of our bookfair voucher (see below) with you, and give it to the cashier upon checkout. They’ll need our Bookfair ID #11315546 to give us credit. Purchases at any location are eligible! 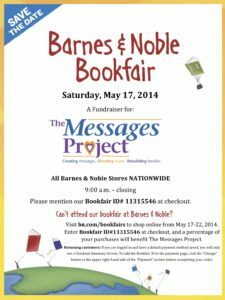 While both the in-store and online events benefit The Messages Project, we will receive a higher percentage of profits from all in-store purchases. Please visit your local store if possible! Here’s another incentive to visit in person: At many locations, Barnes & Noble is hosting a special storytime reading of Oh, the Places You’ll Go by Dr. Seuss this Saturday. To find a storytime close to you, click here. If you’d like to help us spread the word about this awesome event, please download our event flyer and distribute bookfair vouchers to your family and friends. You can also share details by inviting others to the event on Facebook. * Returning Customers: If you are logged in to your BN.com account and have a default payment method saved, you will only see a Checkout Summary Screen. To add the Bookfair ID to the payment page, click the “Change” button at the upper right-hand side of the “Payment” section before completing your order. New Customers or Guests: On the payment page, look for the section that states, “Check Here If This Is a Bookfair Order.” After checking the box, input the Bookfair ID in the required entry field on the payment page.